For immigrants as well as other Texans, basic equity and justice is critical for future financial security and overall wellbeing. Immigrants can be especially susceptible to fraud, misrepresentation, and actors who take advantage of their lack of language skills, lack of cultural and business sense, and other weaknesses, insecurities and necessities. However, immigrants to Texas are not the only ones who can be deceived, hoodwinked and suffer financially or otherwise at the hands of bad actors. Texas law recognizes that property and financial gain can be obtained improperly through concealment, fraud, misrepresentation, duress, undue influence, or through similar wrongful behavior designed to take advantage of immigrants and other Texans’ weaknesses. Texas Judges have broad judicial discretion to redress wrong or unjust enrichment by bad actors in keeping with the basic principles of equity and justice. 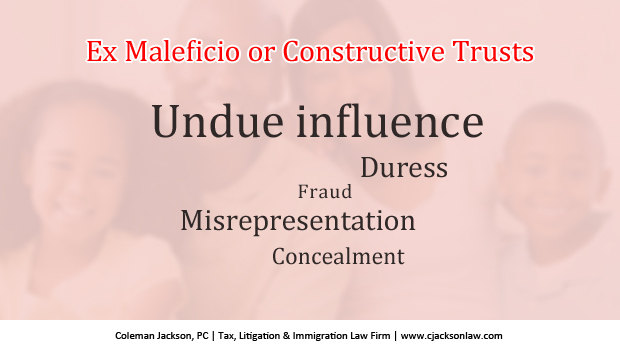 These judicially created trusts are technically called ex maleficio and the types of behavior that a bad actor can engage in to be declared a trustee in Texas is unlimited. Constructive Trusts are an equitable remedy obtained by bringing a lawsuit in the Courts of Texas. Ex Maleficio or Constructive Trusts do not depend on the intentions of the parties. The parties need not agree to create a trust. There need not be any written or verbal agreement between the bad actor and the other person to create a trust. The bad actor does not even need to know that they are a trustee and will be held to the standards of a trustee in Texas. Constructive Trusts arise when legal title to property is obtained by a person in violation of an express or implied duty owed to an immigrant or someone entitled to rightful ownership of the property. The property in question could be real estate, mineral interest, personal property or any other kind of property held in hostility by the bad actor against the rightful beneficiary owner of the property. Immigrants are not the only Texans who can be defrauded or otherwise hoodwinked—anyone can fall to the craftiness of deceivers. Buyers beware. A property owner cannot possibly pass along any better title to property than he or she holds. The taint of wrongfully acquired title to property follows the property until the tainted property is acquired or otherwise transferred to a good faith purchaser who is without knowledge of the facts and circumstances that would create a Constructive Trust if challenged in a court of law. The basic principle is that where someone holding title to property is subject to an equitable duty to convey the property to another (the immigrant who has been hoodwinked, for example) on the ground that he would be unjustly enriched if he were permitted to keep the tainted property, a constructive trust is created in the State of Texas. The equitable remedy of Constructive Trust is subject to the broad judicial discretion of Texas Judges in pursuit of basic equity and justice. This entry was posted in Family Immigration, Taxation and tagged Constructive Trusts, Ex Maleficio on April 20, 2016 by Coleman Jackson.